tranquil and serene. Constructed on the edge of the River Clyde, the building now seems detached from the water due to the intervening traffic and the dense foliage of the river walkway. For more than a century, it was crowded by neighbouring buildings; now it can be viewed and appreciated on all four sides. 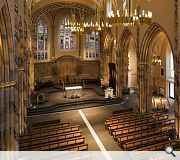 Despite many internal changes, the Gothic exterior remains largely unchanged and the Cathedral is an elegant and striking architectural feature, presenting an attractive appearance from all directions and from either side of the River Clyde. 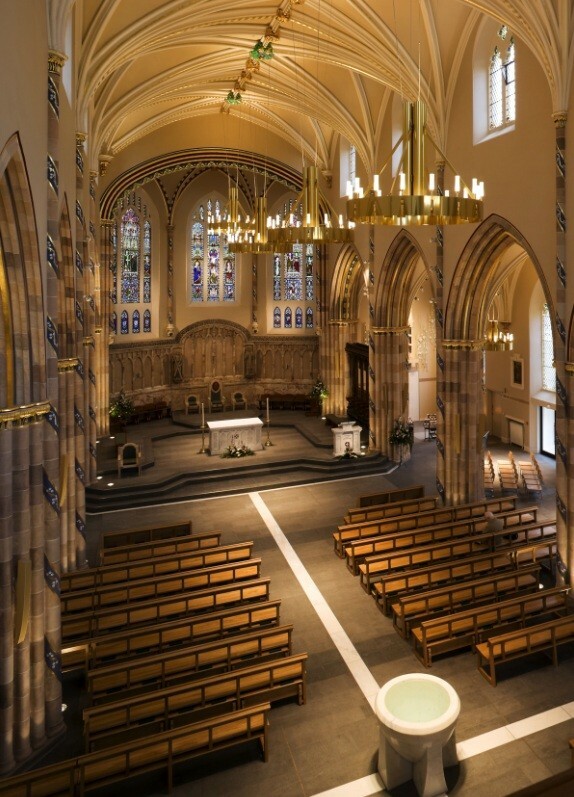 principal church of the Archdiocese of Glasgow and the seat of its Archbishop. 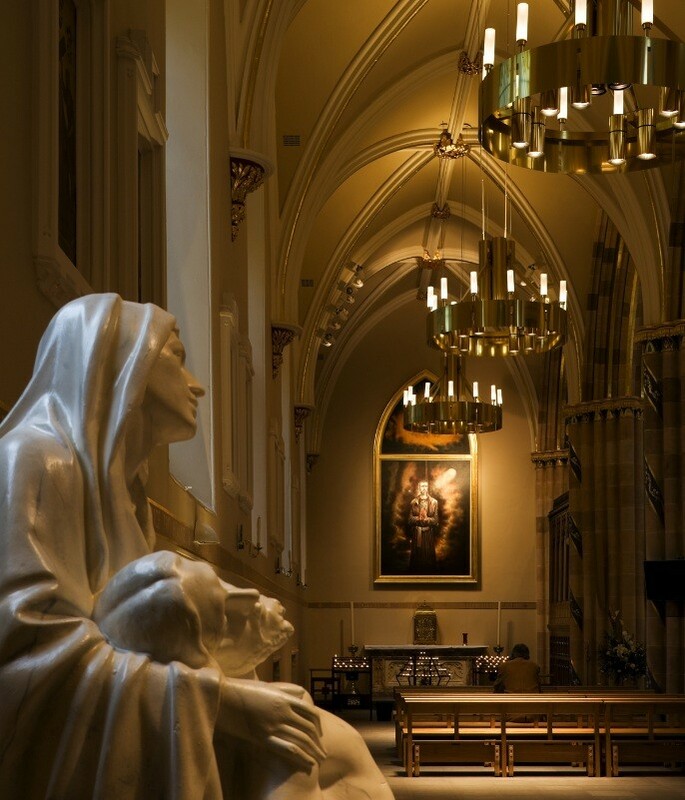 Through a number of interventions, it was intended that the space available for the functioning of the existing building be increased in order that the Cathedral could function satisfactorily into the 21st Century. A full programme of conservation has been undertaken on the stained glass as part of the project. A rich bold colour scheme including much gold leaf has been introduced based upon the colours within the stained glass windows. The external enclosing elements of a new cloister has been constructed to the South East of the existing Cathedral. (The internal glazed wall and roof will be built as part of a future phase of works): The formation of the cloister, will in the future, provide a flexible multipurpose space or series of spaces that increase the Cathedral’s potential as an appropriate social, exhibition, conference and educational building. The use of stone is continued within the extension and the use of materials – bronze, lead and stone, reflects and reinforces the import of the existing building. In addition to the cloister, a number of new commissioned works of art have been inserted into the existing building fabric including a new font by artist Tim Pomeroy, a new painting by Peter Howson of Blessed John Ogilvie (the only post Reformation Scottish Saint) and new doors by the artist Jack Sloan. 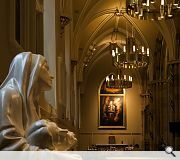 New life has been breathed into the Cathedral and new space has been created to allow the building to flourish into the 21st Century. It is hoped that the funds become available to complete the vision for the building in the near future.